DEENDAYAL Upadhyaya came from a poor family and was brought up by his maternal uncle. In school days he was known as a brilliant student and stood first in almost every examination. But even during his brilliant career he was also known for his social outlook. Normally a bright student who rises from poverty on the strength of his intelligence often becomes self-centred. He keeps thinking that he would make money and achieve position in the society. But Deendayalji did not belong to this category. He not only mixed with friends of all types but even considered it his responsibility to see that those of his friends who lagged behind in studies could pass the examination. It is said that while he was staying in Kanpur as a student in the hostel of the Sanatan Dharma College he actually conducted a class of those students who got zero marks in all subjects and helped them to pass. It was Deendayalji’s very nature to think of devoting his life to some social cause. It was, therefore, a fortunate coincidence that at this juncture he came into contact with the workers of the Rashtriya Swyamsevak Sangh and accepted the work of the Sangh as the mission of his life. 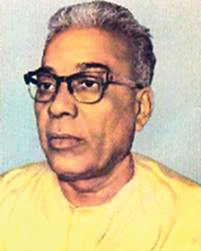 He left everything else to devote himself to the work of the Sangh, and in a short time became a full-time Pracharak. He proved such a devoted and successful Pracharak that branches of the Sangh sprouted wherever he went. The Swayamsevaks were attracted towards his qualities and came under his cultural influence. More and more people came to notice his sterling qualities and it was not long before he was given the responsibility of Joint Provincial Pracharak of Uttar Pradesh. This responsibility he shouldered with great sucess for a number of years. Pandit Deendayal was not only brilliant of intellect, he was also scholarly by habit. He read widely and had a flair for writing. When people around him noticed this quality, efforts were naturally made to put it to use. He was given the responsibility of a weekly journal as its editor. Naturally his studies and his writing progressed, and the result was his two very popular biographical books on Chandragupta and Shankaracharya. Thus, all workers came to look upon Pandit Deendayal as a good worker, a thinker and a writer. It is clear that this successful image was the result of his sterling qualities. As a successful worker of the Sangh he gathered people to himself, took them along on his path, and influenced them. Whoever came into his contact became his friend for ever. Deendayalji was never seen to be angry. Not that there were no occasions for annoyance. Many times people made rnistakes, but Deendayalji just told them to correct mistakes, and forge ahead. He was one of those saints who magnified even small virtues of other people and considered his own qualities secondary. The great spread of the work of the R. S. S. in Uttar Pradesh is mainly due to the work done by Pandit Deendayalji. His personality was a special blend of some innate qualities and some cultural influences imbibed on coming into contact with the Sangh. It was with such a rounded personality that Pandit Deendayal Upadhyaya had entered the Bharatiya Jana Sangh. The Jana Sangh had come into being when in certain circumstances Dr. Shyama Prasad Mukherjee came to the conclusion that a separate political party was the need of the hour. On forming the party he began to look for workers and found Deendayalji. Deendayalji also may have thought that the formation of the new political party was necessary in the circumstances prevailing in those times and so he entered this party. His versatile organisational capacity and his devotion to the cause were easily noticed by Dr. Mukherjee. As the number of party workers was small in those days Dr. Mukherjee naturally came into contact with them. These contacts with Deendayalji so impressed Dr. Mukherjee that within a year he entrusted the responsibility of all-India Secretaryship to this young and comparatively inexperienced worker. This shows the high degree of his confidence in Deendayalji. Pandit Deendayal Upadhyaya fully lived up to this confidence reposed in him. He discharged his responsibilities with great ability. In the begining the Jana Sangh was just an object of curiousity for the poeple. People used to laugh at it and during elections they used to ask not how many seats the Jana Sangh won but how many deposits were saved. It was in this atmosphere that Deendayalji worked as the General Secretary of the party, built it up, created a band of workers and inspired them to work. He worked with ideal such selfless devotion that he could be cited as the ideal Karma-yogi described in the Geeta. After the passing away of Dr. Mukherjee the entire responsibility of organising the party fell on Deendayalji. It was after Dr. Mukherjee’s death that Jana Sangh became an all-India Party. 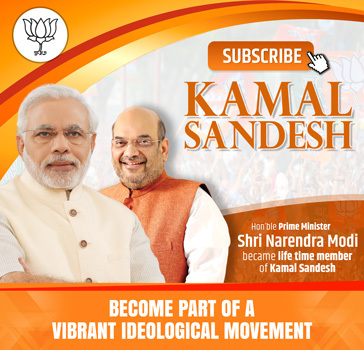 It was due to Pandit Deendayalji that the party acquired an all-India outlook. 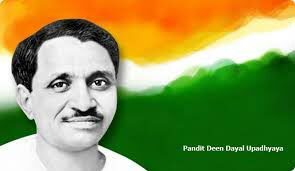 If there is any one person to whom the credit for creating the image of the Jana Sangh—an image so powerful that some People have started talking about the Jana Sangh “taking over”- – goes, it would be Pandit Deendayal Upadhyaya. Once when Shri Y. B. Chavan was the Chief Minister of Maharashtra, a Jana Sangh M. L A., Shri Rambhau Mhalgi, made a speech on the Five-Year Plan. In reply Shri Chavan said the Five-Year Plan was not the subject of the Jana Sangh, and hence it was not necessary for him to give a reply to the speech. But now Shri Chavan will not talk of the Jana Sangh in this manner. On the other hand the Jana Sangh has now created so much fear in his mind that even after the Jana Sangh has merged in the Janata Party Shri Chavan keeps dreaming of it. This strength of the Jana Sangh and the ideology that it acquired along with the strength are an acheivement of Pandit Deendayal. Deendayalji read a lot, thought a lot and also wrote. The key to his being able to find time for all this in the midst of a very busy life was the caption of his speech in Calicut, -Charaiveti, Charaiveti”, which means “Always on the Move”. Deendayalji found time for his reading and writing even during his journeys. For this he preferred to travel by slow train in a coupe rather than in a four-berth compartment of a fast train. This gave him time, but perhaps this also brought about his tragic end. For it is possible that what happened to him in the end would not have happened if he had been travelling in company. Deendayalji was a scholar of both—the old and the new. He had a comprehensive outlook. He was not one of those who thought something was good only because it was old, nor did he belong to those who accepted every new thing as beneficial for the world. He did not agree that something written in olden works a couple of thousand years ago was necessarily the eternal truth….